Understanding the explosive nature of stellar supernovae and the subsequent production of elements is one of the more challenging problems undertaken by SciDAC. 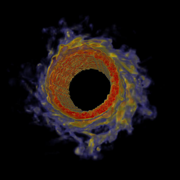 The set of astrophysics efforts supported by SciDAC and VACET range from modeling supernova explosions to cosmology and early universe formation. The computational astrophysics projects produce very large, multi-field, time-varying data at DOE's open computing facilities. SciDAC2 will begin to include efforts that aim to compare the results of simulations with supernova spectrum and cosmic microwave background radiation observations. the ability to perform simulation-simulation and simulation-observation comparative visualization and analysis. Achieving these objectives will require a multi-year, coordinated effort that leverages the best current and new capabilities from visualization and scientific data management. 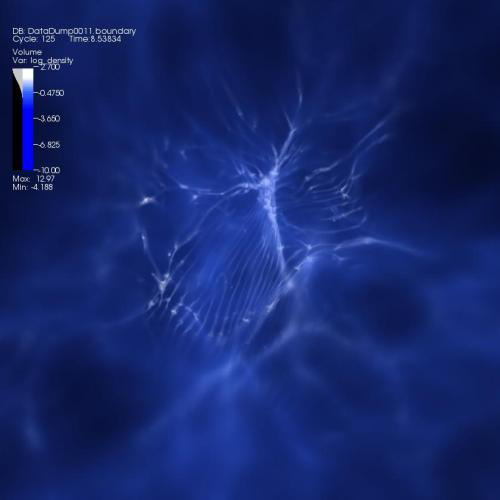 Volume plot of the logarithm of gas/dust density in an Enzo star and galaxy simulation. Visualization created with VisIt. Visualization of Magneto-rotational instability and turbulent angular momentum transport from a simulation of matter in a swirling disk surrounding an attracting central object analogous to a newly formed star. The presence of magnetic fields can cause the disk to become unstable and develop turbulence, thereby causing the disk material to fall onto the central object.